1. Before 1999, the French franc and Spanish peseta; the coins and notes of both currencies, however, remained legal tender until 2002. Small amounts of Andorran diners (divided into 100 centim) were minted after 1982. 2. Also .cat, shared with Catalan-speaking territories. The Simple English Wiktionary has a definition for: Andorra. 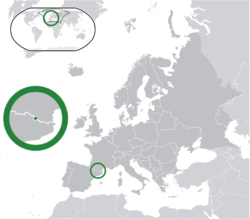 Andorra (officially called the Principality of Andorra) is a European country between Spain and France. There are about 84,000 people living in the country. The capital is Andorra la Vella. It is ruled by a Spanish Bishop and the French President. Andorra's government is a parliamentary democracy. Andorra is a rich country mostly because of tourism. There are about 10.2 million visitors each year. The official language is Catalan, although Spanish, Portuguese, and French are also used. It is not a member of the European Union.The euro is the money used. It is said that Charles the Great (Charlemagne) gave the Andorran people their country in return for fighting against the Moors. Before 1095, Andorra did not have any type of military protection. The Lord of Caboet and the Bishop of Urgell decided to rule Andorra together. In 1607 Henry IV of France said the head of the French state and the Bishop of Urgell would be co-princes of Andorra. Andorra declared war on Imperial Germany during World War I. It did not do any fighting. They stayed against Germany until 1957 because they were not in the Treaty of Versailles. Andorra doesn't have an Army. France and Spain help to defend Andorra. The country has a police force of 295. Andorra is in the Pyrenees mountain range. The highest mountain is Coma Pedrosa. For other locations in Andorra, see List of cities in Andorra. The population of Andorra is mostly (90%) Roman Catholic. Their patron saint is Our Lady of Meritxell. Children between the ages of 6 and 16 must have full-time education. Education up to secondary level is paid by the government. The University of Andorra (UdA) is the state public university. It is the only university in Andorra. ↑ "CIA – The World Fact Book – Andorra". https://www.cia.gov/library/publications/the-world-factbook/geos/an.html. This page was last changed on 17 August 2015, at 05:56.